Home > Beer Store > Beer Dispensing Equipment > Keg Taps & Parts > European "U" "Guinness" Tap - N.A.D.S. European "U" "Guinness" Tap - N.A.D.S. EUROPEAN "G" TAP - N.A.D.S. Also called a Guinness tap. 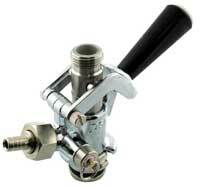 Fits European kegs with "U" style keg valves. These look similar to american valves but they ain't! Will fit kegs of Guinness Stout, Harp Lager and Kilkenny and others.